Being invited to lift in The Animal Cage is a big deal. Some of the strongest people in the world will be watching, along with a rapt crowd. Here's how one powerlifter prepared for the event. The Expo at the Arnold Sports Festival in Columbus, Ohio, each year is, in a single word, madness. It's a seething mass of pushing bodies, glaring posters, and high-volume noise that can feel overwhelming even to people who've been to dozens of similar events. But some parts are crazier than others. While the majority of the booths are handing out samples, pushing products, and focusing on the dollars and cents, Animal envisioned a different approach when we first visited the Arnold over a decade ago: Bring the barbells, dumbbells, squat racks, a bench press, and a deadlift platform to the expo floor. Throw up a 20-foot chain-link cage around it, and let the best powerlifters and bodybuilders in the world put on a show for fans while they stand just a few feet away. Over the years, "The Cage" has come to be known as the "Super Bowl of Powerlifting" in many lifters' eyes. 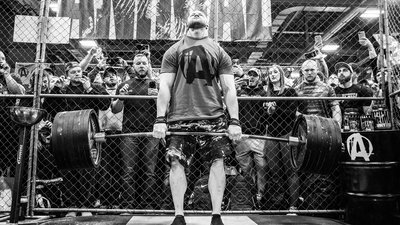 No, it's not an official competition, and no, what happens aren't official "recorded" lifts. But that doesn't mean they don't count. Being invited to lift for the crowd here is a major honor for any lifter. Just ask Pete Rubish. This up-and-coming powerlifter has already pulled 920 pounds at a bodyweight of just 245, and totaled 2028 pounds in competition. He's even pulled 800 pounds an astonishing 18 times in a single workout for an Animal video earlier this year. He knows the pressure of a big stage and a heavy weight, but he also relishes grinding through high-rep sets with weights that would buckle other strong lifters. In short, he was perfect for The Cage. Here's how he prepared. "Originally, I planned on doing 660 for 15 reps," Rubish says, "But I wanted to increase the challenge. Because we decide what we're doing in these things like 2 months out, and then obviously as The Cage gets closer, plans change. So I decided I wanted to do 735 for 10." On Pete's Instagram leading up to the event, you can see him pulling 695 pounds for 10 reps, then 710 for 10—both beltless. The latter, he says, was a "massive PR," but he knew it was only the appetizer for the main course in Columbus. When Pete arrived in Ohio on Friday, an immense surprise was in store. Russian Olympic weightlifting and powerlifting champion Mikhail Koklyaev, one of the greats in the sport, wanted to deadlift with Pete while he was in town. "I just thought what better time to do it than on Saturday when I'm lifting," Pete says. This wasn't going to be a competition, per se—Koklyaev was coming off a triceps tear, after all—but a chance to push one another to a great performance. "It's not often you get to be around a legend like that, and it made me step my game up," Pete said. Promotes Recovery, Increased Energy, and Greater Strength! With the crowd screaming, the MC booming, and Koklyaev having already pulled a single at 755 pounds, the stage was set for Pete's battle against 735. At another time in his life he would have prepared by making himself see red, but in this case, the only red was his Animal T-shirt. "That's a lot different than in the past, when I would try to get as angry as I could, and get all amped up," he recalls. "Now, it's like I try to calm myself. I try to focus. Deep breaths. Close my eyes and just get into a state where there's nothing around me. I block it all out. It's just me and that bar in front of me. I know what the goal is, and I set up to do that. And no matter what gets thrown at me, I'm still in that same state." In short, he tried to mimic his training in his home gym. Earbuds went in, the crowd went away, and it was just man and iron. For six reps, the bar went up as smooth as silk. Number seven was a grind, but Pete can grind with the best of them, and he locked it out—even though he was brought to his knees at the end of the rep. But he kept his hands on the bar. This was a crucial moment. Would he stop? "For the eighth rep, I basically know that this is all I've got," he recalls. "This is going to be it. It's going to be a matter of if I can get this up or not. And I'm thinking about how tired I am, and how heavy this feels, but I know I have to try it. I want to go to absolute failure. I don't want to leave anything back. No second guessing as far as if I could have done more reps."
He pulled. The bar went up…then came down. He was done. But as Koklyaev walked toward Pete and raised his hands in the air, it was clear that this man had left it all out there. The goal was 735 pounds for 10 reps; the result was 735 pounds for 7 reps. But a PR is a PR, and Pete wasn't going to dismiss it. "I'm not too upset, but I would have liked to do better. That was a pretty cool moment when Mikhail lifted my arm up," he recalls. "It was a really good day. Just not quite what I would have hoped I could hit. It's still the most I've ever done beltless." That's the beauty and cruelty of The Cage. You get one opportunity to display what you can do, and that moment defines you in the eyes of everyone present—maybe even some of your heroes. Would you play it safe or would you push it until you had absolutely nothing left in the tank? For this powerful strength icon, there was no doubt. "Live in the moment. Enjoy it," Pete says. "Try to take it all in and do the best you can when you have the opportunity, because it might not always be there."